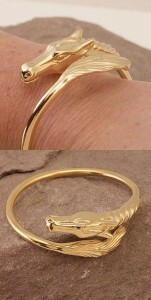 Designed with an exciting energy, this Gold Horse Head and Tail bracelet is one of our favorite pieces right now. It reminds us both of classic Celtic horse jewelry and one of our most beloved horse jewelry designers, Hermes. With a lineage like that, how could you go wrong? You’ll notice right away how detailed this bracelet is. The horse’s face is so expressive, eager and ready to take on the world. The tail flairs out like it was flying on the wind. The bracelet is gold layered over sterling silver, for a brilliant look at an affordable price. It’s a great bracelet for men or women, and can easily become the horse jewelry you wear every day. In a similar vein, but with a more elegant, structured style is this Sterling Silver Large Horseheads in Stirrups bracelet. We love this piece too – it’s bold and distinctive. This bracelet is made for the larger wrist. It’s sized for a person who has an 8 to 8 1/2 inch wrist, making it a good choice for both men and women. The bridled horse heads are exquisitely detailed. With ears forward and nostrils wide, we’ve got two horses ready to take their shot at the show ring. Great for the active, ambitious horse lover. Finally, we’ve got a great piece for fans of modern horse jewelry. This Stirrup and Horseshoe Motif Bangle Bracelet features two horseshoes in the middle and two stirrups on the side. Check out the detailing: the connecting pieces of metal are marked to resemble the stitching on leathers! Made of sterling silver, this horse bracelet has a beautiful soft patina. It’s a great piece you can wear out – or to the office! Always appropriate and shining with style, this is a great bracelet for the horse lover. Which horse bracelet is your favorite? I like the first and the second one they’re very fine and very beautiful.